The Many Lives and Secret Sorrows of Josephine B is the first book in a trilogy that encompasses Empress Josephine’s entire life. This particular volume is about her childhood, first marriage, and life during the French Revolution. It’s told from her point of view – her diaries in fact, and the occasional letter. I knew little about her going into the series: I didn’t know she was from Martinique or that she’d been married before Napoleon. Josephine – called Rose in this volume – is charming and gracious and constantly fighting to help individuals, both her family and people she barely knows. Rose is so sweet and charming and gracious, that she will naturally infect you. It’s also an intimate look into the French Revolution, which is so often treated grandly. It’s a big subject, so that’s understandable. But this book shows the human side of it. What was it like to live during such interesting times? 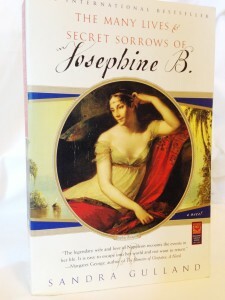 Josephine will get swept into those grand events, but this volume is immediate and human. Which is probably why it was a bestseller when it came out.